ALK have been stalwart supporters of the Navteq maps since the launch of CoPilot PDA software way back in 2002. Today they have announced a switch from Navteq to Tele Atlas, bolstering the coffers of their SatNav rival TomTom. ALK's Managing Director, Michael Kornhauser, says "We are excited to work with Tele Atlas as a partner for digital maps and location content; their stringent processes and content enhanced with community input add even more value to our products..."
Gent, Belgium, 18 June 2009 � Tele Atlas, a leading global provider of digital maps and dynamic content for navigation and location based solutions, and ALK Technologies, a specialist in mobile navigation software and transportation technology, today announced a license agreement whereby ALK will use Tele Atlas maps and dynamic content in more than 200 countries and territories worldwide. 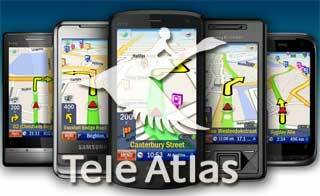 The agreement gives ALK access to Tele Atlas� global digital map content and products, including content for more than 24 million points of interest (POIs) and additional map enhancement products that can further enrich the mobile device users� navigation experience. ALK�s award-winning CoPilot� GPS software makes every journey easier by delivering a fully integrated navigation solution for the mobile environment, with useful navigation-based services such as live local search and weather via the phone�s mobile Internet connection. I don't understand the logic of depending on your competitor for your maps. This must have caused a great deal of development and retesting so one can only assume there is a very good reason. I had been looking forward to a release of CPL using the Navteq Transport data base allowing road and vehicle sizes to be taken into account when routing. Clearly this isn't going to happen. I gues TA must have an equivalent data base so perhaps that is better. I believe I read somewhere that a release of CPL for Trucks in the USA didn't do to well - was that due to map quality? Other products - e.g.Pronav - which seem to be based on Navteq Transport have not so far met with much enthusiasm so perhaps there are big issue with Navteq maps that as users we simply cannot see because they are hidden by the software. I is also true to say that TT have shot themselves in the foot over TT Nav 7 for PDA's and there was speculation that Sygic may become the TT mainstream PDA route. I have tried McGuider and have basically given up on it so maybe TT are looking for a better partner. It will be interesting because I understand a new vesion CPL8?) is expected daily. I recently used CoPilotLive "pan-European" maps and found them to be terrible. How is it possible that many, many major autoroutes are not in the system? Honestly, these roads take years to build; engineering and environmental studies go on and on before that; drawings, routing etc. are readily available, satelite photos show them under construction. But somehow, CoPilot Live / Navtec were caught by surprise and these giant projects are missing from their current maps. And when exactly was the last Co-Pilot V7 map update!.... @@@@@@@@@ they have got to be the worst Sat-nav company I have ever spent money on! at a guess I would say that the "Latest" (only) map data I have is at least 4 years out of date, when you compare to IGO or TomTom who update a few times a year, I've had NOTHING from ALK for Co-Pilot V7. Just to let you know that ALK selected TeleAtlas as an aditional mapping provider, it doesn't mean that they ditched Navteq at all. They will be using one or the other depending on the regions and partners. Might be an idea to explain that you are from ALK to avoid confusion there Nelene. Doesn't really matter how many deals they sign.... If they never issue any updates! I agree, that is if I understand what you mean. For me, TomTom's recent reversal of their TomTom Navigator 7 release for cellphones was solely to stop the pirating and to gain a little sorely needed cash. (They didn't even release it for North America, nor offer TTN8 software). In the future, TT won't provide any more software for cell phones, it will just be pirated. iPhone however is a different story IFAIK because it can't be hacked and pirated as easily since it's a closed system integrated with the iPhone hardware. Since the iPhone gets constant rave reviews, this isn't such a bad outcome. If you are suggesting that Apple will buy TomTom as is currently the buzz, I'm not so sure. Though for years I've been saying someone big (Microsoft, Yahoo, Google) would buy TomTom for location based services, but I'd say Apple is a less likely fit. I have been contacted by ALK today to put the record straight about the announcement made by Tele Atlas. Reading the Tele Atlas press release it appears that they were to become the mapping provider for CoPilot. We were unable to contact our PR contact in ALK as he is on his honeymoon sso we published the Tele Atlas Press Release with my own comments. It transpires that ALK will be using both Navteq and Tele Atlas for map data in their products going forwards. This has occurred because certain un-named partners have reqested having Tele Atlas maps as opposed to Navteq. I have been reliably informed that Navteq will continue to provide map data for the UK, and it is unlikely that this will be switched to Tele Atlas. As far as piracy goes, the iPhone is just as susceptible as any other solution, though granted the WM Smartphones were easy to crack, but anyone with the know-how to jailbreak and unlock an iPhone must surely have the ability to do the same to TomTom software. Nothing is completely hackproof, they just need the incentive to do it. Hacking a $0.99 app just doesnt have that incentive, hacking a popular $100 (guess) app probably does.